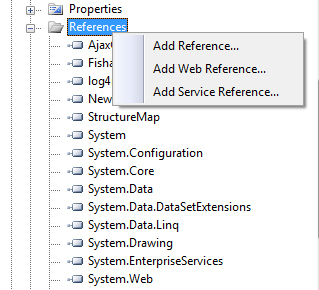 Right click on References folder in your web project and click Add Reference as shown in below image. Select all the binaries from binaries folder as shown in image below and click OK. Now your project is ready to use features of MangoChat.net. This delegate method will be used by MangoChat.net control for retrieving chat user details. We have used FakeDAL over here just to give an overview how it will look like. You can use your own code for retrieving user details here. * This is a dummy method which returns currently logged in user. * You can have your own implementation here. Finally MangoChat.net is ready to show its magic. Run the application in two different browsers (e.g. Chrome and Firefox) to try it out. Delegate method for retrieving contact list of logged in user. We have used FakeDAL over here just to give an overview how it will look like. You can use your own code for retrieving user details here. MangoChat.net provides you with two chat data storage options out of the box. In-Memory is the default option for MangoChat.net. Converting it to Microsoft SQL Server storage mode is really simple. All you have to do is to follow these steps. 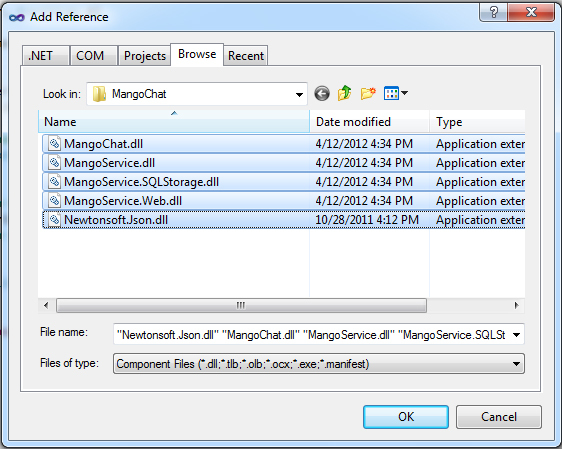 Now MangoChat.net control is ready to execute in SQL Server storage mode. You can check it by checking rows in MangoChat.net tables that you created before on your database. MangoChat.net also has the option of working with other data providers i.e. Oracle, MySql etc. All you have to do is to implement the IStorageProvider interface and initialize Service.Instance.Storage with your implementation in Application_Start. An example of its implementation can be found in demos. MangoChat.net uses the jQuery UI CSS Framework to style itself. jQuery is the most used java script library due to its wide array for plug-in and exceptional ease of use. jQuery UI is the official set of UI widgets provider by the jQuery team. http://jqueryui.com/themeroller/. 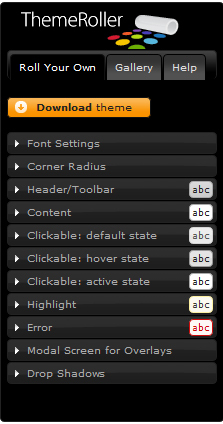 Once you have designed your theme just presses download and you’ll get a zip file containing all the required css and image files. Specify contact group when contact users are retreived Global.asax.cs i.e. For example MangoChatConfig.TimestampFormat = "hh:mm:ss" will show time stamp format like 02:39:03 (two hours thirty nine minutes and three seconds). Copyright © 2016 Mango Chat .Net. All rights reserved.